Part of the EasyAdapters line, the FDB9-TB5+ (Female) and MDB9-TB5+ (Male) are DB-9 to 5-position terminal block adapters. 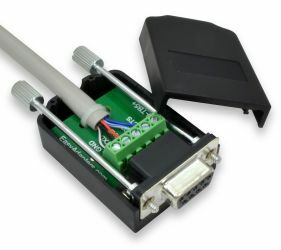 They were specifically designed for RS-232 control ports like those found on AMX & Crestron control systems. The FDB9-TB5+ and MDB9-TB5+ provide separate connection points for the five signals (RXD - Pin 2, TXD - Pin 3, GND - Pin 5, RTS - Pin 7, and CTS - Pin 8) that these control systems use for RS-232 control.